In April, both candidates in the race for President of the United States talked about the “woman card.” Donald said the Democrats were playing it. Hillary replied passionately, “Deal me in.” The ensuing discussion ranged on important topics from equal pay to health care, but we must now add one more. especially among women.” The story was repeated frequently after a new report from the Centers for Disease Control and Prevention (CDC) reported that the age-adjusted rate in the United States was 24% higher in 2014 than in 1999, with the increase among non-Hispanic white females up by a confounding 60%. We see every other disease going the other way, with significant declines in mortality for HIV/AIDS, heart disease and breast cancer over the last decades. This only makes the heartbreak more difficult that our efforts have not generated the same kinds of outcomes with suicide. Leaders in the field publically questioned to what degree more accurate reporting is a factor, as we struggle to comprehend. It’s a little uncanny, but we are living the exact opposite story from five years ago in China. It was 2011, and I was headed to Beijing for the World Congress of the International Association for Suicide Prevention (IASP). And, I was questioning whether their data could be real. The headline at the time: “China’s Suicide Rate Has Declined Drastically.” In the early 1990s, 30 out of 100,000 individuals died of suicide in China annually, compared to 15 in 2009. Instead of 25% increased as in the US, China was reporting suicide was down 50%! And, again, central to the story and the primary driver in the reduction: a significant change related to women. The 2010 Daily Beast blog “China’s Female Suicide Mystery,” explained the hardship on women in rural farmlands, and their strength and pride in withstanding suffering, sadness and stress, to “eat bitterness,” as they call it. “But every woman has her breaking point,” the author concluded in describing the only country in the world where the female rate of suicide was higher than their male counterparts (25% higher in the late 1990s). I’ve written on the myth of suicide as a choice. People die of suicide when their supports, strength, resources, and hope utterly and completely fail. However, this idea has little meaning divorced from the concept of “acquired capability.” It’s been a little over a decade since Thomas Joiner’s Interpersonal Model of Suicide cracked and broke the foundation of what we used to believe about the causes of suicide. Essentially, “acquired capability” suggests that extraordinary intrapsychic emotional pain is insufficient. Dying of suicide requires that the person also has help. The most powerful allies in suicide prevention are our own bodies and minds. Put simply, it’s extraordinarily difficult to harm one’s self because it requires breaching the human innate self-preservation security system. It protects us from threats, both external and internal. Our brain’s amygdala sends us frightening messages to warn us away from sources of pain and death. Our blood clots to stop leaks. Our body will even shut down and reboot, with unconsciousness as a way to restore breathing if required. The difference in the US and China was the method and the means to short-circuit these natural defenses. In the United States, a typical presentation during the late 1990s for a young woman in desperate emotional pain was an overdose and self-poisoning, with the most common substances being benzodiazepines, antidepressants, or paracetamol. After the attempt, the brain’s survival mechanism regains control and the person experiences ambivalence. Outreaching emergency medical services results in 98% of individuals being saved. However, in the rural countryside of China during the late 1990s, a young woman experiencing a similar emotional hell had access to something much more deadly: a jar of organophosphate pesticide with product banned in many other parts of the world. Within a couple of hours of ingesting half a cup of toxic pesticide the individual dies, and there is no opportunity for reversing the course. There was no getting around the obvious: a suicide prevention plan that did not incorporate a critical strategy for pesticides was not going to be effective. It was involved in 60% of Chinese suicide deaths according to the World Health Organization. So, leading researchers in suicide prevention approached large companies that manufacture pesticides, like Syngenta. The ask was that they play an active role in reducing access, as opposed to blame and claiming they were directly responsible given the misuse of their product. The goal was partnership and material change. The recent World Health Organization report “Preventing Suicide: A Global Imperative” was in part sponsored by Syngenta, who has also funded projects to increase the safe-storage of pesticides so that they would be unavailable to those in distress, and assess the toxicity of new formulations of paraquat, a widely used herbicide. Three significant shifts have reduced the level of access to these deadly means. There have been governmental actions to prohibit certain types of pesticides that are the most deadly in several Asian nations, including China and Sri Lanka. And, a migration away from rural farm life to the large metropolitan areas has also meant that many women in emotional distress no longer have access. But, part of the success must be attributed to the pesticide companies who are funding and partnering on creating new solutions. I traveled to China skeptical of the data around a drastic reduction in suicide death, and I returned from this nation of 1.4 billion people convinced that they had answers the United States should replicate. Hundreds of thousands of lives are being saved annually because individuals in enormous distress do not have access to a jar of deadly pesticide. Half of suicide deaths in the United States are the result of firearms. Guns are clearly our pesticide. But, I’ve not been aware of any tangible efforts to replicate China’s success partnering with the manufacturers of the means. We’ve cast stones at times, but true efforts at partnership to date have centered on small gun shops or local firing ranges, and nothing has been taken to scale. Yet. In February, I spoke at a Zero Suicide in Healthcare summit in Washington State and had the privilege to spend a few minutes with the indomitable Jennifer Stuber. She is an associate professor of public policy at the University of Washington and co-founder ofForefront: Innovations in Suicide Prevention. In her April Washington Post opinion piece, she described her initial awkward call to the National Rifle Association after her husband died of suicide. To her surprise, “they were not just willing to talk but also willing to listen.” These are individuals who have also been touched by suicide, and they had been like others in our society, including healthcare- they assumed suicide was inevitable for someone who “chooses” to die. Jennifer describes an active year-long conversation with the NRA and the Second Amendment Foundation about saving lives in Washington State. And, they did what Syngenta and the World Health Organization did in 2007 to address pesticide and suicide. They convened a working group led by Rep. Tina Orwall (D) comprised of gun rights advocates and suicide prevention leaders. The first result of this new partnership is a law signed by Governor Jay Inslee last month designed to reduce suicide deaths by firearm and overdose. Rather than mandating changes, the law focused on encouraging industry participation through incentives and will focus on gun dealers, shooting ranges, gun shows, pharmacies and drug stores. “There was strong backing by legislators on both sides of the political aisle,” Jennifer wrote. In China, reductions in the access to deadly pesticides meant that women were much less likely to die of suicide. In the United States, we are seeing a significant increase in suicide deaths, and firearms are increasingly involved with women. But, the new partnership in Washington State is extremely encouraging that our society is taking serious actions to reverse the disturbing trend. The status quo is well known. “In the US, we cannot have a meaningful dialogue about guns and suicide.” We’ve said it again and again, but Jennifer Stuber and the NRA have proved us wrong in Washington State. “There’s too much self-interest for large manufacturers.” Today, Syngenta is cited as a key partner in the World Health Organization’s seminal report on suicide prevention, and they are creating better solutions that will save lives and have enormous potential to do so at a societal level. Means matter, and we too in the United States can reverse our upward trend of suicide as we take bold steps and engage in new partnerships. Jennifer writes that the Washington state law “marks the beginning of a different way of talking about gun violence in America.” Staking out our common ground is hard work, but leaders in Washington State are simply getting started and moving forward. Blimey! This was the initial one word response when the United Kingdom’s Norman Lamb and I toured the Institute for Family Health (IFH) Harlem Center in north Manhattan. A long-time member of parliament and prior Minister of Health, MP Norman Lamb is not easily impressed. His Liberal Democrats have pressed for the future in mental health, calling for parity since 2010, with the campaign, “No health without mental health.” The party also inspired a nationwide UK “Zero Suicide in Healthcare” dialogue in early 2015. But, as Senior Vice-President Virna Little and her team showcased their integrated services, it was impossible not to conclude that we were seeing the third revolution in behavioral healthcare. Three key innovations stood out: collaborative care management, patient-centered technologies and a central focus on suicide care. There’s no disputing the evidence. In 2002, Jürgen Unützer’s randomized clinical trial in JAMA showed collaborative care was twice as effective for treating depression, improving physical functioning, and reducing healthcare cost as compared with care as usual. IFH was one of the first in the country to utilize the approach beginning in 2003, and over 80 RCTs have since confirmed the effectiveness of the model. The experience shows. The transdisciplinary care team-based approach goes far beyond integration, with dentistry, community outreach, and population health all baked into one. My jaw dropped as we toured the first floor and saw 14 dental chairs with services that include cosmetic care. Exploring the five floors above revealed a remarkable example of near seamless behavioral health and primary care integration. IFH has found this approach essential to combating major chronic illnesses like depression and diabetes, where behavioral health provider staff are elevated to equal contributors alongside primary care physicians, nurses, nutrition, care managers, dental and community health. There’s a remarkable focus on outcomes with the utilization of tools like the Patient Health Questionnaire 9 (PHQ9) and General Anxiety Disorder 7 (GAD7). Mental health has tended to avoid quantitative measurement altogether or utilize lengthy and burdensome tools that made integration across care silos impractical. These brief and evidence-based best practices have united care teams around a common language and process. Treatment at IFH is open-access and fast paced, more akin to the primary care culture than traditional long-term mental health care. Appointments are typically between 20 and 30 minutes and the duration is between 8 and 16 weeks. It’s less about a full and complete history and more about the current presentation, utilizing brief and solution oriented therapies or behavioral activation. While this may look very different than where we’ve been, it’s not only more effective but better aligned with compliance audits where documentation of medical necessity is required. Herculean! The name of this electronic health record (EHR) is fitting, both in terms of market size and ease of use/ functionality. In May 2015, Epic was the top EHR as measured by the most providers nationwide who attested to meaningful use, the certification standards of the Centers for Medicare and Medicaid Services (CMS) to improve care coordination and population health. The collaborative care model is activated by the shared treatment planning, community collaboration and patient engagement that is core functionality of the Epic platform. In addition, the IFH medical leadership has developed and customized within the software clinical pathways and automated work-flows which are creating a learning environment for consistent practice and focused outcomes. In 2010, CEO Dr. Neil Calman challenged the leadership to develop a Zero Suicide initiative to save lives for those most at risk within the IFH community. Virna Little and her team did what they do every day- they brought their robust technology platform and transdisciplinary care teams to the task. They also incorporated key evidence based practices like collaborative safety plans to reduce access to lethal means and introduced training to better equip all staff (like LivingWorks safeTALK). In December, Epic released clinical program guidelines “Preventing Suicides in Primary Care Settings,” based upon IFH’s pioneering work. It included the specifications for screening for risk, and the decision support tools, workflows and SmartForms required to replicate their program. For example, the header banner turns red on every page of the record for an individual with “suicidal thoughts” in their master problem list. The document also includes implementation guidance, securing buy-in from senior management and physician providers and determining the scope of the program. In 2015, the Americans with Disabilities Act (ADA) turned 25 years old. This landmark civil rights legislation determined that confining “persons with disabilities in institutions constitutes unnecessary and illegal segregation.” The 1999 Supreme Court Olmstead ruling verified that individuals with mental health diagnoses were also included under the protections of the ADA and could not be held in asylums simply because the state had not invested the appropriate resources in alternatives. Since the 1960s, the emergence of the second revolution in behavioral healthcare, the Community Mental Health Construction Act, created a system of outpatient services that seemed substantially improved over the largely state-run institutions that preceded them. However, segregation of individuals with serious mental illness away from the larger primary healthcare system has persisted in very significant ways. The third wave of behavioral healthcare is full and equal integration. It is empowered by technology. Suicide care is a central focus. And, the future is already here. The saying goes that it’s just not widely distributed. Well, stay tuned. The pioneers at the IFH Family Health Center of Harlem have shown us our future destination, and they have also shared the road map for getting there. Clean, clear blue sky. 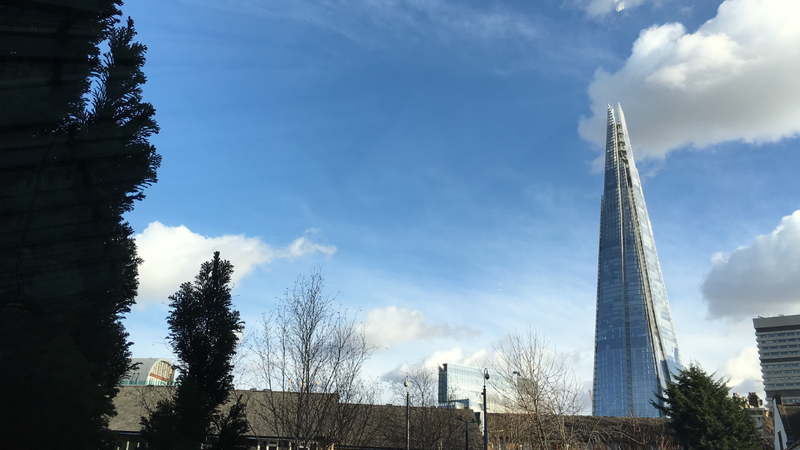 I snapped this picture of the iconic London skyscraper known as the Shard last week, a rare one as it lacks the ubiquitous jam of black taxis, big red buses and cars crawling through the streets. But, it evokes what might be. Hard to imagine and totally impractical given the infrastructure that exists today? Maybe, but instead of conceding smaller targets IPPR went the other way. They urged Londoners to imagine the ultimate goal and pursue it with earnest. If you guessed that the candidates balked, you would be wrong (see Mayor Candidates Commit to Zero). We humans aspire to the heights. We tackle wicked problems. And, when we stretch and dream of the vision we desire, despite it seeming impossibly out of reach, we galvanize resources, we break through with new ideas, and we achieve amazing things. The venue for the picture above was the Hotel Novotel. 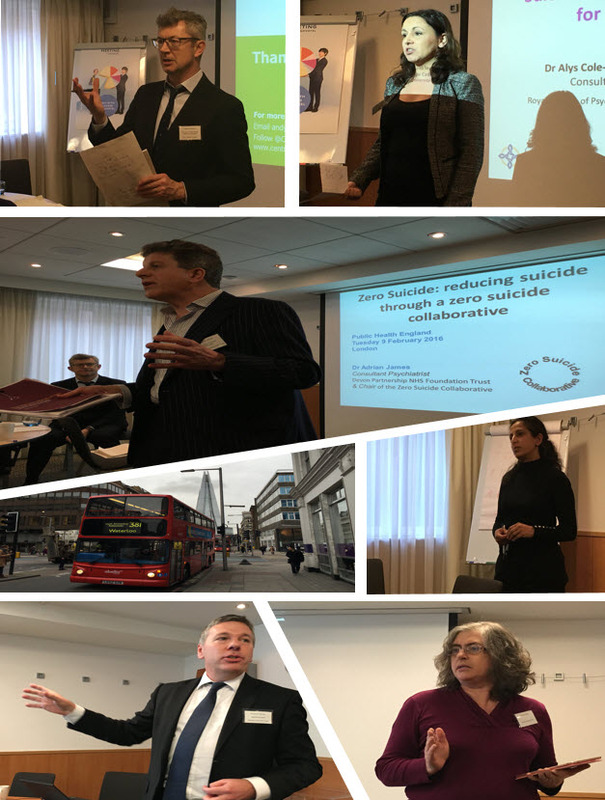 I was there to participate in a forum of the three major UK Zero Suicide pilots hosted by Public Health England. The inspiring day was led and facilitated by Director Wellbeing and Mental Health Gregor Henderson and Public Mental Health and Wellbeing Manager Helen Garnham. It was my privilege to kick off the morning with a reflection on the current state of Zero Suicide (see my presentation PowerPoint). I started with the concept of the BHAG, a Big Hairy Audacious Goal, and reviewed the history of El Capitans that healthcare has already ascended or begun to climb (see “Is Your BHAG as Humbling as El Capitan?”). Gregor referred to Zero Suicide as a “movement,” and it is officially an international one with growing pilots in the US, the UK and the Netherlands. The early adopters are strong missionaries carrying the flame to others. The clinical soul is deep and rich- the movement has its heart. 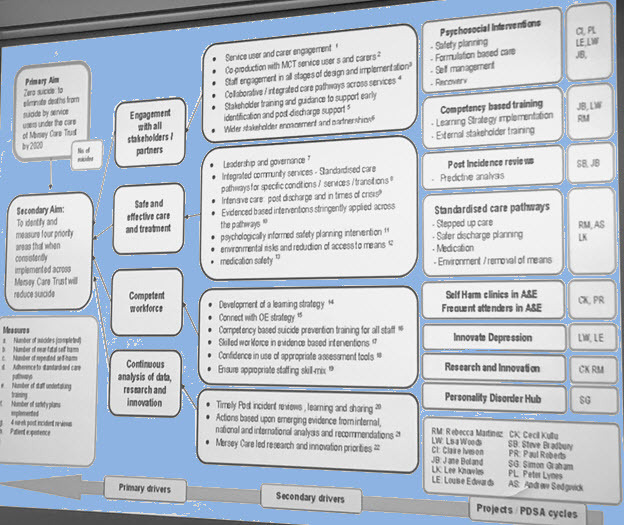 South West Strategic Clinical Network– Dr. Adrian James, Chair, challenged the group that changing the clinical approach to suicide will have cascading benefits for the overall care. The South West vision is based upon a mindset, a methodology and markers. Mersey Care NHS Trust– Dr. David Fearnley, Medical Director, on the partnership with Mersey and Cheshire Suicide Reduction Network Strategic Partnership Board, “Suicides are not inevitable.” Safe and effective care and treatment exists already, but a competent and skilled workforce must be equipped. East of England Strategic Clinical Network– Dr. Caroline Dollery, Clinical Director, shared key characteristics including relevant training, local community champions and creating attitudinal change. Three different programmes, but the Henry Ford Health System focus on robust performance improvement was clearly in the DNA of each. None of them claimed any magic formula or pioneering innovation. Instead, they each believe there are tried and tested methodologies that healthcare must employ with rigour. And, we are seeing the first strong steps towards strengthening the science. Andy Bell presented on the Centre for Mental Health evaluation of the East of England Zero Suicide programme. In the US, the National Institute for Mental Health has recently released RFA-MH-16-800 seeking Applied Research toward Zero Suicide Healthcare Systems. Ann John closed out the day encouraging the group to move forward with further evaluation. As part of Public Health Wales, Ann is national lead for suicide prevention and chairs the national advisory group to Welsh Government on suicide and self harm prevention. Alys Cole King (Connecting People) presented on training clinical professionals and Joy Hibbins (Suicide Crisis Centre) talked about her lived experience and the respite program that her team has since created to meet the needs of those at risk. Simon Large is chief executive of the Bradford District Care NHS Foundation Trust, which operates the centre in the grounds of Airedale Hospital. 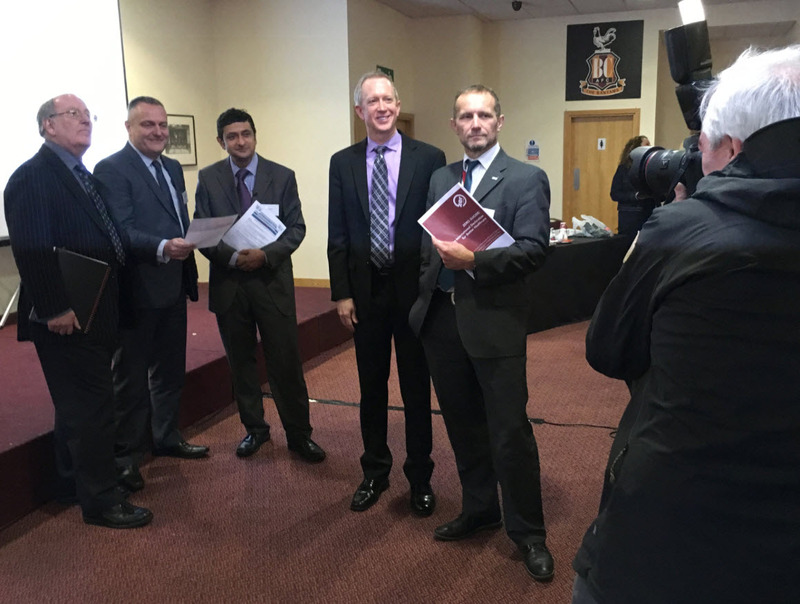 He shared, “We are fully committed to the ‘zero approach’ and have been inspired by hearing the experience of others who have adopted this aspiration.” Dr. Mike Doyle is leading the local efforts, and working to develop a consistent model across West Yorkshire (see local news coverage). Whereas in London I spoke about the outcomes and evaluation components of Zero Suicide, in Bradford my message was the clinical underpinning. Including people with lived experience (think about this experience as “lived expertise”) in the design and leadership of these programmes alongside other stakeholders creates something different. And, rejecting the myths about the inevitability of suicide for some people are key ingredients of Zero Suicide (see my presentation PowerPoint). International expert Professor Nav Kapur provided a keynote address on the UK wide perspective from the National Confidential Inquiry. His presentation buttressed the systems approach with the 2012 findings regarding mental health services that had implemented 24 hour crisis teams, dual diagnosis policies and/or multi-disciplinary reviews. Overall, their study concluded that systemic changes save 200 to 300 lives per year (see Implementation of mental health service recommendations in England and Wales and suicide rates, 1997-2006). In December 2015, the United Nations convened in Paris a climate change conference attended by most of the countries in the world. The discussion centered on incremental improvement, and whether setting a goal of limiting global warming to less than 2 degrees Celsius (°C) compared to pre-industrial levels was enough. By contrast, Londoners are dreaming of a city that is a global leader in climate change. Zero Carbon, they are calling it. And, beginning in March, 2016, a group from 13 nations will release “Zero Suicide: An International Declaration for Better Healthcare” (see advance Final Draft). 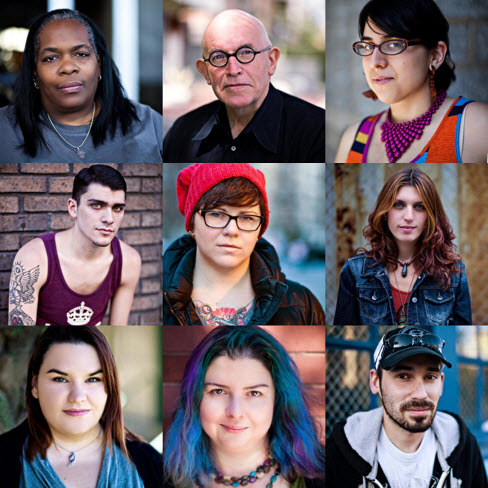 Zero Suicide is equal parts aspiration, social movement and culture change. It represents a new mindset to harness enthusiasm and create action. So, the status report on Zero Suicide after a quick trip to the UK: We have climbers in three countries who have surveyed the wall, identified the summit, and… begun to climb. As more healthcare leaders join, let’s all make progress together. If you are interested in supporting the global dissemination beginning March 6, 2016, please contact us to become a Zero Suicide Ambassador. A-10 Thunderbolts and Crisis: What Happens With Precision and Focus? “Hey, look! It’s a pair of A-10 Thunderbolts!” The distinctive buzzing hum of the planes’ turbofan blades distinguished them as “Warthogs” well before I could make them out. The four of us stood in the parking lot of ConnectionsAZ Crisis Response Center and admired these marvels as they lined up in the sky above us for landing at Tucson’s nearby Davis-Monthan Air Force Base. Hours later, during our return drive to Phoenix we reflected on our tour and the striking success that can be achieved when a group knows exactly what they want to do… and then just does that and little else. The A-10 has one mission only: destroy tanks. Period. Its front landing gear offset from center, the plane was literally designed around the 30 mm Gatling rotary cannon, which sprays depleted uranium armor-piercing shells at rates of nearly 4,000 rounds per minute. Targeting small, slow-moving targets is difficult for fast jets. The A-10 flies low and slow to accomplish its singular mission and this means absorbing significant amounts of damage. In order to stay focused on its mission, the A-10 engines and pilot are wrapped in 1,200 pounds of protective titanium armor. All so that it can… destroy… more… tanks. That’s it. In Good to Great, business visionary Jim Collins describes the magic that occurs when a team crystallizes their reason for being and refuses to be distracted by anything else. He contrasts the fox, which is good at many things, and the hedgehog which is the master of one thing. Like the A-10. Dr. Margie Balfour is Chief Clinical Officer at the Crisis Response Center in Tucson and also serves as Vice-President for Clinical Innovation and Quality at ConnectionsAZ. Dr. Balfour graciously facilitated a tour of this state of the art facility which was opened in 2011. 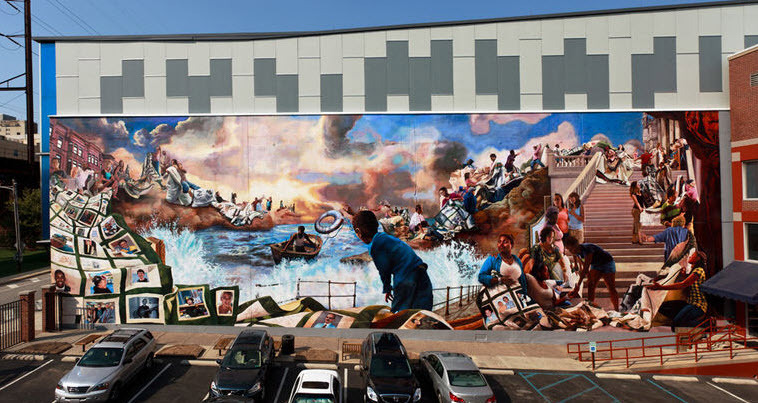 The result of a $50 million community bond, the Crisis Response Center facility housed crisis stabilization, with 23 hour observation and sub-acute residential beds, and separate units for adults and children. A secure “sally port” facilitated transfers from law enforcement, and a covered walk-way connected the facility to Banner University Medical Center South Campus, which includes an emergency room and acute care psychiatric inpatient unit next door. In addition, a crisis call center and peer warm line was co-located in this fully integrated and coordinated model. In the original approach all these different services were subcontracted through a single vendor, an approach that might be described as “foxy,” to borrow again from Jim Collins. On April 1, 2014, ConnectionsAZ began operating the crisis stabilization programs inside the Crisis Response Center, and Dr. Balfour relocated from Texas to Tucson to provide the medical leadership. A circuitous career path that started off as a scientist prior to developing a passion for clinical in public sector behavioral health established a foundation for a new kind of precision and focus. If the A-10 singular mission is dispatching tanks, what is it for crisis? It seems self-evident that crisis services should be about getting the best care to people experiencing a psychiatric emergency… FAST. It’s an emergency, and the response should match. When the call comes in, the firefighters proverbially slide down the pole and roll the trucks. Remember the opening theme to the long running NBC hit ER… everyone is running! Lives depend on it. Yet, the reality of crisis services is often the exact opposite. It can take hours or even days in an Emergency Department to be “medically cleared” before entrance is granted to many of the nation’s crisis stabilization programs. Law enforcement and first responders are expected to take the person in crisis to the hospital first, not the crisis unit. The experience of the over 13,000 individuals that utilized the services of the Crisis Response Center each year had been uneven. There were often long delays in the clinical triage area while the patient awaited a decision on whether they would be admitted or discharged. Frustration abounded, which was compounded because the same questions were repeated several times during the process. The result was a decrease in safety and increase in injuries and assaults. Individuals in crisis were sometimes left unattended for long periods of time and staff were spread thin between the crisis programs and interview areas. Security was frequently involved. There was a significant need to improve and speed the triage process, but there was a lack of agreement on the mission of the facility. Dr. Balfour and the ConnectionsAZ team met with the leadership and front line staff in a series of town-hall meetings, conducted rounds in the facility to interview patients and staff, and worked shifts providing clinical care to view the experience up close and personal. The result of this process was an A-10-level singular mission: Meet the immediate needs of those in behavioral health crisis in a safe and supportive environment. In order to reengineer the Crisis Response Center for this new mission, Dr. Balfour and team utilized Lean Six Sigma. Motorola and Toyota both revolutionized process improvement, by eliminating waste and improving the flow of manufacturing, and by building upon the pioneering work of Edwards Deming in the 1950s (think Plan-Do-Study-Act). Healthcare has been slow to catch the vision, and crisis care for behavioral health has been characterized by waiting in lines, for both the patients and the various internal and external agencies with whom these programs collaborate. The team began by establishing some assumptions. They would achieve gains with the existing resources and staffing by standardizing the process and eliminating waste and inefficient practices. They also introduced a number of interventions, including improved dashboard tracking tools. Next, they analyzed wasted time and function. What were the tasks that added value? What were the tasks that added little value but were nevertheless required (by licensure, contract, etc.)? And, finally, what were the tasks that were waste? The value analysis found that the old process required almost 11 hours, and that nearly 40% of this time was simply unnecessary and non-value added. Wasted time. For individuals and family members dealing with a behavioral health crisis. Idly sitting in the waiting room was a significant portion of this time, but there were also inefficiencies in some of the other tasks that needed to be improved. The outcomes were Thunderbolt! They decreased the “door to door dwell times.” The average time spent in the triage clinic decreased from seven hours to two hours, and the time in the 23 hour unit decreased 30%, improving not only the patient experience but also the capacity through improved through-put. Even if you haven’t been in a psychiatric crisis, most everyone has been to the Emergency Room, and the key metric we all remember… how long did it take us to see the doctor? Dr. Balfour’s team reduced the waiting time by nearly 80%. These significant gains had other cascading benefits. For example, the facility reduced dramatically the time it spent on diversion so that it could better serve the needs of those in crisis in greater Tucson. Assaults to staff and calls to security were also dramatically reduced, and the changes in process yielded additional space. The building was remodeled to take advantage of these improvements and the capacity of the temporary observation unit was increased by 36%. Dr. Balfour believes there were several key ingredients in their success. They engaged everyone from top leadership to the line staff. They kept compliance and quality functions separate, and obtained Lean Six Sigma green belt certification for quality staff. And, they built the IT and data system necessary to track and report accurately on the performance. When I think of the A-10 level focus of the ConnectionsAZ culture, the metric that comes to mind most readily is law enforcement drop-off turnaround time. First responders don’t take people in crisis to the emergency room first. They drive straight to crisis facilities in Phoenix or Tucson where they spend between five and ten minutes before returning to their patrol. Precision and focus. Business is changing healthcare, and lean six sigma has come to psychiatric crisis services. The results are in, and it’s time for us to re-model our own A-10 Thunderbolts. We can measure our performance and progress through the levels below. Level 1 Everyone in the organization/department knows what the unit’s core processes are. Level 2 Each core process is fundamentally documented. Level 3 The primary customer requirements of each process are documented and conformance to spec is tracked. Level 4 The primary control factors that drive desired performance for each process are documented and tracked. Level 5 Each process can be documented to be behaving as intended (e.g., is “in control”). Level 6 Each process is completely standardized, in control, and has an on-going continuous improvement plan. Note: Dr. Margie Balfour will be one of the presenters at the National Council for Behavioral Health conference in Las Vegas on March 7 – 9. Also, check out her article: “Crisis Reliability Indicators Supporting Emergency Services (CRISES): A Framework for Developing Performance Measures for Behavioral Health Crisis and Psychiatric Emergency Programs,” Community Mental Health Journal, 2015 (download here), which includes the outcomes model below. Four different compelling reasons. Public safety. Civil rights. Extraordinary and impactable waste of public funds. And, the opportunity to address one of our most intractable human problems. The time is now, and the burning platform is clear. It does not have to be this way. In a few states and communities across the U.S., solutions are in place. But until now we do not have the vision or will to approach crisis care with national resolve and energy.